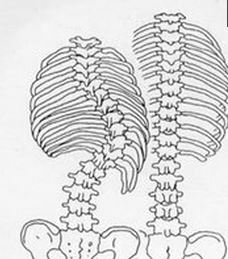 front or back, the spine appears to be curved. Most scoliosis is detected in children on school screening exams or a family doctor or a parent. Clues that scoliosis may exist includes uneven shoulders, a prominent shoulder blade, uneven waist, or leaning to one side. A bone exam and X-ray is usually taken to determine if scoliosis exists and, if so, the magnitude of the curve. When mild scoliosis is detected early on and treated with specific applied kinesiology approaches to balancing muscle function, it can often be entirely eliminated. Moderate scoliosis can he alleviated to a significant degree and helped so that it does not progress.